Camp Trillium (officially The Trillium Childhood Cancer Support Centre) offers year-round recreational experiences to bring children with cancer and their families together. We work to provide an environment that normalizes relationships and experiences, helping them in the healing process and enhancing their quality of life. All programs are designed to incorporate all abilities whenever possible. We are governed by a board of directors made up of pediatric oncologists, medical oncology team, parents, community members and business professionals. We are accredited by the Ontario Camping Association, and follow the guidelines of Canadian Association of Pediatric Oncology Camps (CAPOC). 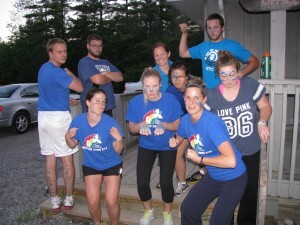 Camp Trillium is also a gold-star member of the Children’s Oncology Camping Association International (COCA-I). All of our programs are free to the families. We are funded by generous donations from individuals, service clubs, businesses, and foundations.